Light and frequent sand topdressing is a great tool to improve greens surface firmness, for poa greens to suppress anthracnose, and to help manage organic matter at the surface of the green. But how much sand should be applied? Ideally, topdressing sand would be applied at a rate that matches the deposition of organic matter as leaves, stems and roots senesce and decay. To get a rough idea of how much sand to apply over the course of the year, we have developed a simple US units spreadsheet that uses growth potential (GP) as a guide, and a maximum sand application of 150 lbs dry sand/1000 sq ft per month at maximum turf growth. The maximum sand application rate was selected from the rates used by Hempfling et. al. in their Best management practices effects on anthracnose disease of annual bluegrass report. The spreadsheet uses the monthly average temperature to calculate growth potential and then uses growth potential to determine the sand application rate. For weekly applications, divide the monthly application rate by four. PACE Turf has upgraded it's weather services to include the Weather Underground Personal Weather Station (PWS) dataset. This addition will allow you to select one of the 250,000 weather stations worldwide that might be closer to you than one of the regional airport weather stations. You can also add a weather station at your site that can be accessed through the Weather Underground PWS system (Personal Weather Station Buying Guide). To find a nearby station, browse to Wundermap and enter your city or navigate around the map to find a location station near you. Once you have found a station, click on the numbered tag to reveal the personal weather station ID number. Follow the instructions below to change the alternate weather station in your PACE Turf profile. Browse to Wundermap and find the PWS that you are interested in. Click on the small numbered tab to open the PWS details. Note the station ID. It will be something like KCASANFR957. Copy the station ID to use in your PACE Turf profile. Please copy it, and don't try to enter the station number manually in step 5 below, because it's sometimes impossible to tell whether the symbols in the station code refer to a number (such as the number one) or a letter (such as the lower case letter "l"). Log into your PACE Turf account and click on My Account located in the blue box at the top of the page. When you are in the My Account page, click on the Edit Profile link below the Member Links heading on the right side of the page. In the Alternate Weather Station entry box, type pws: and then PASTE (don't manually enter) the station ID you copied from WunderMap (it should look something like this: pws:KCASANFR957). To be sure the system is working properly click on "Weather" located in the green navigation bar near the top of the PACE Turf webpage. If you receive a list of error messages, there is a problem with the weather station information entered into the Alternate Weather Station box. If this is the first time you have entered a new station location, there may be a delay of several seconds as the PACE server caches the weather data. Once you successfully enter an Alternate Weather Station all data for future PACE Turf email Weather Alerts will be sourced from the new location. Have you ever been interested in the turfgrass growth potential (GP) for a location where research has been conducted or where a colleague is located? If you have, then you will appreciate the new GPAvatar application. The GPAvatar app provides a rapid way to generate simple GP graphs for most US zip codes. As an example, the graphs provided with this Update illustrates the range of climates and GP in California. If you are a Twitter user, you can download the GPAvatar graph to use as your Twitter icon to let the world know your turfgrass growth potential at a glance. To stimulate lunch-time conversation, print the GP graph and post it on the lunch room referigerator to see if anyone can figure out what it represents. This might help staff appreciate turf growth conditions throughout the year and when the grass is stressed. For those of you that are participating in the Bayer Rewards (Accolades) program, we are pleased to announce that you can now use your points to purchase PACE Turf memberships. Just login to the Bayer Rewards website, and click on the "Catalogue" button. Then, click on the "Tools of the Trade" category in the left menu bar. You will see the PACE Turf membership option listed there. 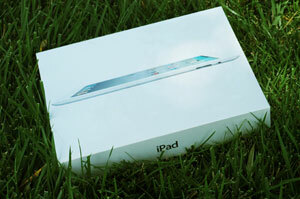 The 2011 PACE Turf iPad2 Giveaway introduced more turf management professionals to PACE Turf and social networking sites such as Facebook. More than 350 people liked the PACE Turf on Facebook. Thanks for your participation! The PACE Turf Facebook page provides samples of information from the PACE Turf website and YouTube channel that are of interest throughout the year. If you like what you see, please take the tour and consider joining PACE Turf - the most comprehensive and well organized technical resource for turfgrass managers. OK, so we couldn’t stop at 10. Once we got started listing tools that we have found to be effective, that are easy to use and to acquire, and that are relatively inexpensive, we found at least 15 turf monitoring tools that we think should be in every superintendent’s arsenal. This information was presented in the "Answers on the Hour" Session at the February, 2011 Golf Industry Show in Orlando. For those of you that didn’t attend the session, please feel free to download and print this handout (131 KB pdf) for further information. Intrigued by the weird designs on the back of the handout? These QR codes are a type of bar code that can be rapidly scanned with your smart phone’s camera to gain immediate access to a website. The codes on the back of the handout correspond to the websites of each of the manufacturers listed on the front of the handout as sources for the tools that we recommend. Although some phones have built in QR readers, iPhone users will need to download a QR application (usually free or under 2 dollars). To find out what you need for your phone, just do an online search for the model of your phone, followed by the words QR reader. Not a PACE Turf member yet? 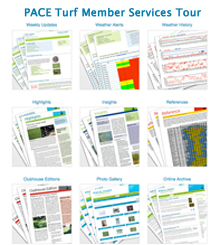 For more information on how PACE Turf’s member website, emails and videos can help you get the answers you need, please take the tour of PACE Turf member services, visit our home page or read what other turf managers have to say about the benefits of membership. We are looking forward to the GCSAA conference and show next week, and hope to see many of you there. We are teaching three different courses this year, and hope you'll have some time to stop by before or after one of the classes to say hello! (schedules and locations are listed below). For those of you who won't be in Orlando this year, we're planning on reporting back on any new and worthwhile information that we can glean. Wednesday, February 9, 2 – 2:30 pm: " Ten turf monitoring tools that you can't do without: a demonstration". Trade Show Floor, Booth 1585. With 16,000 golf courses spread throughout the U.S., the golf course industry impacts us in many ways. The articles below have been produced by researchers to measure the effect of golf courses on the economy, on the environment, and on the production of greenhouse gasses. Overall, the impact of the industry in all of these sectors is a positive one. See this video for more information. Haydu, J.J., A.W. Hodges, C.R. Hall. 2008. Estimating the Economic Impact of the U.S. Golf Course Industry: Challenges and Solutions. HortSci. 43:759-763. Templeton, S.R., M.S. Henry, J. Bihui and D. Zilberman. 2002. Economic Impacts of California's Golf Course Facilities in 2000. Research Report RR-02-01, Department of Agricultural and Applied Economics, Clemson University and Department of Agricultural and Resource Economics, University of California, Berkeley. Milesi, C., Running, S.W., Elvidge, C.D., Dietz, J.B., Tuttle, B.T., Nemani, R.R, 2005. Mapping and modeling the biogecochemical cycling of turf grasses in the United States. Environmental Management 36(3):426-438. Rufty, T, Rees, R. and N. Hamon, 2010. Carbon footprints of urban landscapes. Golf Course Industry, August 13, 2010. Property profile and environmental stewardship of golf courses, 2007. The Environmental Institute for Golf. Water use and conservation practices on U.S. golf courses, 2008. The Environmental Institute for Golf. Nutrient use and management on U.S. golf courses, 2009. The Environmental Institute for Golf. Energy use and conservation practices, 2012. The Environmental Institute for Golf. Pesticide use on U.S. golf courses, 2012. The Environemntal Institute for Golf. We hope that we have kindled your interest in PACE Turf's information service with the information above. If you join today, you will have immediate access to weekly emailed updates, educational videos, site-specific weather and pest forecasts, state-of-the-art web site and many other services that will help you to prevent turf problems before they occur, save you time and money, and keep you current with the newest management products and practices. At $275 per year, or just $ 0.75 per day, it's a bargain that you can't afford not to take advantage of! For more information, please take the tour of PACE Turf member services, visit our home page or read what other turf managers have to say about the benefits of membership. Please also feel free to contact us at any time. We look forward to having you join us! The following analytical laboratories conduct soil and water nutritional analyses. Many also conduct plant tissue analyses. PACE's guidelines for soil nutrition, irrigation water quality, and turfgrass tissues are available on this site. Please note that this is only a partial listing of analytical labs. PACE Turf utilizes Brookside Laboratories for most analytical laboratory services, soil, tissue, water, geotechnical and environmental. Brookside Laboratories Inc., and it's association of independent consultants, stand at the leading edge of technology for high-quality and accurate analytical services to agriculture, environmental and sports turf throughout the world. Selecting which product or practice will perform the best for you is one of the most important — and also one of the most difficult— decisions that turf managers face. The fact that some materials are marketed with little or no data, or with misleading data, complicates your decision ten-fold. One of our main goals is to supply PACE Turf members with science–based guidance on the efficacy of turf products, practices and management strategies. Whether we are reviewing the performance of gray leaf spot control agents, sod webworm products or strategies for moss control, we always provide a listing of the options that will perform best, in our analysis. But how do we determine which strategies to recommend, and which to omit from our publications and presentations? The internal guidelines shown below were developed here at PACE Turf over the past 20 years, and, because they are based in the scientific method, they give us confidence that the recommendations that we pass along to you are as useful and dependable as possible. The guidelines below may also be useful to each of you in product selection decisions, as well as in communicating to vendors the standards that you will use to evaluate the products that they are promoting. Each research trial must have a detailed protocol that describes the objectives of the study, as well as detailed materials and methods that include statistical analytical methods and experimental design parameters. Treatments must be replicated and include appropriate non–treated controls. In addition, current method(s) of choice should be included for purposes of comparison. Trials should be conducted, supervised or coordinated by a qualified independent researcher or consultant (university or extension researchers, Certified Crop Advisors, Certified Professional agronomists, Certified Soil Scientists, independent researchers with a minimum of a B.S. in agricultural or related sciences). Publication record in peer reviewed science journals is a plus. Unknown researchers are required to supply a resume and references with their research reports. Raw data must be provided by researchers to PACE Turf upon request. PACE Turf may re–analyze raw data to confirm conclusions. The product or practice should be tested in multiple locations (a minimum of 3) and, if feasible, in multiple environmental regions. Products that are selected for use in PACE Turf management recommendations must show a substantial positive effect. A statistically significant response alone is not sufficient, as it does not necessarily show that the product will provide a useful and practical solution for PACE turf clients. Data cannot be "cherry–picked" so that only favorable data is provided for review, and negative data is withheld. Not on Facebook yet? Neither were we, until recently. So far, we've had many different impressions — it's fun, it's perplexing, it's riveting, and it's definitely a potential black hole for your valuable time. But it's also a great resource for connecting with professional colleagues, as well as relatives and friends (both current and long–lost). It's free, it's easy to register, and worth a look. Hope to see you on the PACE Turf Facebook page soon! The spreadsheets, references and procedures below were developed, with support from a GCSAA grant, to assist superintendents in creating an IPM Plan for their golf courses. The IPM Planning Guide was the result of this two year effort. Use this guide, or the tools listed below, to starting building your site specific IPM Plan. We developed the growth potential model to explain myriad of ways in which weather impacts turf growth. The model considers turf growth to be good when the growth potential (GP) is between 50% and 100% (the best possible growth occurs at a GP of 100%). However, when weather conditions are either too hot or too cold for optimal turf growth, the GP falls below 50%, and turf becomes progressively more stressed. When the GP falls to 10% or lower, growth is extremely limited. We have listed a few of the many uses of growth potentials below. Timing application for chemical transition accelerators (Kerb, Revolver, Monument, Manor, Blade, TranXit): Warm-season turf GP should be 50% or higher at the time of application in order to ensure that sufficient warm-season turf cover is present. Scheduling aggressive management practices (aerification) or stressful events (tournaments): Turf growth potential should be as high as possible (greater than 50%) and on the rise when stressful events are scheduled. This allows for the greatest recovery potential of the turf. Explaining why cool- or warm-season turf is performing poorly (or well). After a heat spell, predicting how long will it take for cool-season turf to begin active growth again. Table of growth potential at different average air temperatures (pdf). Table of growth potentials in selected US Cities (pdf). The IPM Planning Guide, which was recently launched on the GCSAA's Environmental Institute for Golf web site, represents the culmination of a multi–year, multi–institution collaboration that we are very proud to have been part of. The Guide includes all of the tools that turf managers need to develop a comprehensive integrated pest management plan -- from climate assessments, to spreadsheets for management planning and financial analysis, to guidelines for everything from soil and plant nutrition to pest management. The entire Guide is available, free of charge, to all turf managers, whether they are GCSAA members or not. Whether you are developing your very first IPM plan, or are refining a plan that has been in use for years, the IPM Planning Guide makes it easier, and dare we say more fun, to bring your IPM programs to the next level. For more information, see also the July, 2010 Golf Course Management article, "Bringing IPM to the next level". We will also be teaching a half–day seminar that revolves around the Planning Guide, "Tools for managing economic challenges: the IPM planning guide and precision turf management", at the Orlando GCSAA Education Conference (February 8, 2011), and will be giving a GCSAA webinar on the topic, "Making the most of your IPM plan", on November 18, 2010. Go to the GreenPartners website where you can either login to redeem your points (if you are a GreenPartners member) or enroll. Enter "PACE Turf" into the search box of the Rewards Catalog. You can also find us under the category "Special Services" (item number 23332). BY PHONE: Call GreenPartners toll-free at 877-375-0824 and select option 4 from the menu. Place your order for the PACE Turf Membership, item # 23332. If you are not familiar with GreenPartners, it is Syngenta's customer appreciation program. Members of the program can redeem GreenPartners points for many different reward options, including, of course, the crème de la crème of their catalog — the PACE Turf eMembership. Are they a gimmick by manufacturers, or a great new tool for turf managers? A prescription for fungicide overuse, or a more effective approach that takes advantage of fungicide synergies? These are just some of the questions raised as superintendents try to decide whether a fungicide combination product is the best choice for them. This PACE Turf Reference on Fungicide Combination Products (140 KB pdf) lists the active ingredients, and their concentrations, in commonly available fungicide combination products. This Product active ingredient calculation spreadsheet automatically calculates the rate of each fungicide active ingredient delivered to turf for any product that you are interested in. Calculations are available in both metric and English units. For more information, please take the tour of PACE Turf member services, visit our home page or read what other turf managers have to say about the benefits of membership. Please also feel free to contact us at any time. We look forward to working with you soon. Based on input from members who want the convenience, money savings and environmental sustainability of an all-electronic membership, PACE Turf is happy to announce its new, paperless eMembership option. eMembers will receive all of the benefits of regular membership in PACE Turf, but with all services, including publications (Highlights, Clubhouse Editions, Insights and References) available exclusively online or via email. PACE Turf will also continue to offer regular memberships, at $325 per year. This membership includes all eMember benefits plus print versions of PACE publications (Clubhouse Editions, Highlights, Insights, References and an Archive notebook) mailed to your address. Simplify your life: reduce paper, mail and office clutter by printing out publications only when you need them. Help the environment: it’s amazing how many resources a paper mailing can generate, including fuel for air and ground freight, paper, envelopes, ink and electricity for printing. Online Weather Services: The Weather Update page provides forecasts of weather, turf growth and pest occurrence, and is updated several times a day for your location. The Weather History page gives you detailed information on past weather conditions at your location. The online Member Forum allows PACE Turf members from around the world to easily communicate about new ideas, practices and products. Online publications can be printed out when and where you need them. Clubhouse Editions are one-page publications designed to educate golfers on the science behind your management practices. Highlights summarize key events of the past month in a 4-page color publication. References are essential tools for turf management, with publications on soil, weather and pest management guidelines. Insights are publications that translate science into practice with in-depth analyses of turf agronomic topics. The online Archive gets you the answers fast with a searchable library of hundreds of PACE Turf publications, research reports and references. Interested in eMembership? For new members, just check the eMembership box on the online membership form, or on the mail-in membership form. For renewing members, you will be given the option to switch to eMembership at the time of your next renewal. PACE Turf developed the virtual irrigation audit as a tool for diagnosing coverage problems with irrigation systems, and for predicting the performance of new irrigation systems even before they are installed. Recent data indicates that the system can also be used to accurately predict the location and the size of disease outbreaks. To learn more, visit the Super Journal website, and read the report, "The Virtual Irrigation Audit: A Diagnostic Tool For Turfgrass Disease". The PACE Soil Nutritional Guidelines are based on our soils database of over 15,000 samples. For information on a variety of other turf management guidelines, click here. Researchers at North Carolina State University have begun tackling one of turf management's more perplexing questions: which fungi cause fairy ring, and what are the best management practices for dealing with each of them? If you have been plagued with fairy ring, you already know that textbooks identify over 60 different fungi that are known to cause fairy ring. But what the textbooks don't say is that most of these fungi are uncharacterized. What's more, it isn't clear whether management methods that work for one fairy ring fungus will work for others. Send 1-2 cup cutter plugs from the leading (outside) edge of the ring. If mushrooms or puffballs are present, place as many as possible in soil sample box or paper bag (no plastic!!). Is it difficult-to-control brown patch, or is it the new disease known as brown ring patch (caused by Waitea circinata)? If you would like to have a definitive diagnosis made, Dr. Frank Wong of the University of California, can help out. To send him a sample, follow the instructions on his Turfgrass Pathology Diagnostic Lab website. Dr. Wong requests that you include a completed sample submission form with your shipment, and that you call (951-827-2936) or email (turfpathology@ucr.edu) the lab before you ship. Diagnostic fees are $98 per sample (up to 2 plugs) which includes a report detailing the disease diagnosis, basic salinity, pH and nitrate testing, and control recommendations. An invoice for payment will be sent along with the diagnostic report. On July 27, 2007, PACE hosted a turf tour for 35 plant pathologists who were in town for the American Phytopathological Society meetings. The participants, who came from all over the U.S., were able to view a cornucopia of turf types and turf uses — from the paspalum fairways of Fairbanks Ranch CC, to the GN-1 bermudagrass at the Del Mar Thoroughbred Club, to the kikuyugrass fairways at Torrey Pines GC, the poa/bent greens at Mission Bay GC and the overseeded Bullseye bermudagrass at Petco Park. The all-day tour was a great success, thanks to the superintendents listed below who so graciously hosted us. We want to take this opportunity to thank them here for their time, their insights, and their generosity in sharing their experiences with all of us. Congratulations to the 2006 PACE IPM Photo Contest Winners! It is with great pleasure that we announce today the winners of the 2006 PACE IPM Photo Contest. 1st place photo by Steve Thomas First place: Steve Thomas of Pelican Hills Golf Club (Newport Coast, CA) for his photo illustrating the benefits of selecting cultivars with disease resistance. Steve's photo met all of our criteria for a great looking image that communicated an important IPM practice and included a well written legend. Steve will be able to select either a Canon A700 or a $300 gift certificate to 47th Street camera for his first prize. 2nd photo by Ron Parker Second place: Ron Parker, CGCS, for his photo demonstrating the diagnostic power of an electrical conductivity meter. By the way, the reading of 19.20 on Ron's meter converts to over 50 dS/m total dissolved salts. These are extreme conditions, and there is no turf type that will survive in soil with that salinity level. Ron will receive a $200 gift certificate from 47th Street Photo. 3rd place photo by David Major Third place: David Major, CGCS of Shady Canyon Golf Club (Irvine, CA) for his photo of wireless sensors that can provide useful information on soil moisture, temperature and salinity. David will receive a $100 gift certificate from 47th Street Photo. Congratulations, Steve, Ron and Dave for your prize-winning work. And thanks again to all of you who participated. Your excellent photos will remain on the PACE Public Edition website, where they will be a valuable resource for turf managers all around the world. A note on spelling: Check the spelling of your title and description with a dictionary, an on-line spell-checker or a helpful friend or spouse. You have put a lot of work into the photo and you are trying to convey your technical know-how and professionalism. Don't ruin the effect with a poor spelling! Titles: Titles should be very brief -- 5 words or less -- and should grab the observer's interest by honing in on the most important feature of the photograph. "Anthracnose on poa" or "Beneficial ladybird beetle" are examples of good titles. Avoid long, narrative titles such as "Anthracnose on this poa green occurred after long heat spell and tournament in Chicago, IL." This type of information should be left for the description (see below). The description should be easy to read, and should be able to stand alone (it should make sense, even if the photo is not present). Examples of photos with good titles and descriptions appear below. Wetting fork for LDS management A wetting fork can be used to re-wet areas with severe localized dry spot. Bentgrass green, southern California, 1993. Photo by L. Stowell. The PACE Turf information service delivers science-based solutions to turf management problems with breaking research news, information and expert advice that is customized for your location. Dr. Wendy Gelernter and Dr. Larry Stowell translate science into practical information that comes to you via emailed newsletters and weather alerts, a state-of-the-art website, and print publications that you will refer to again and again in the development of your turf management programs. To acquaint you with the PACE Turfgrass Research Institute Photo Gallery, a digital photo library that is available free of charge. To provide some prizes and to have some fun in the process! Entry deadline: The contest runs from July 5, 2006 to September 15, 2006. Each participant may submit only one digital or scanned photo in .jpeg (.jpg) format. We will not accept entries that are submitted via conventional mail/postal services. See our IPM Photography Tips for suggestions on taking a prize winning photo. Photos may not exceed 1,000 X 1,000 pixels at 150 dots per inch (dpi). File size should be less than 200 KB. Use of submissions: All photos submitted for the contest will be made available on the PACE website’s Photo Gallery, and may be used by any interested person for non-profit educational purposes. Your photos will not be used in sales, advertising or marketing activities. Your photo submission is your agreement that the photo can be used on the PACE Photo Gallery website without notification or renumeration. Submit your photo on-line by logging in to the PACE Photo Gallery. What exactly is IPM (Integrated Pest Management) anyway? With hundreds of "official" definitions available, it is hard to pin down one single answer to this question. There is even disagreement over who first originated the term. The confusion that results is a bit frustrating, but shouldn’t be surprising. IPM is a concept that is constantly evolving, along with advances in pest control technology and our understanding of pest biology. For example, genetically engineered crops, precision management and newly imported pests such as the emerald ash borer are changing the way we think about IPM, even as we write this piece. Rather than add to the confusion by proposing yet another definition (though if you are interested, you can view IPM definitions from the past and the present by clicking here), we have listed below some of the key pest management topics, concepts and practices that are common to almost all definitions of IPM. For guidance on the types of images that are being sought in the PACE IPM Photo Contest, look over the information below. Your photo should be related to one or more of these themes. Click on the thumbnail photos to the right for examples. If you have questions about whether your photo is suitable for demonstrating IPM topics, concepts and practices, please feel free to contact us. Reasonably priced digital cameras and inexpensive photo software have brought digital imaging into the grasp of every turf manager -- whether they are golf course superintendents, sports field managers, or students. The only thing that stops us from unleashing the power that digital photography has to improve our communications, our record keeping and our jobs is that we need to turn our cameras on and start taking pictures. This short tutorial will describe how to take photographs successfully and what steps are needed to prepare images for use on the web. Almost all digital cameras also include A (automatic) and/or P (program) controls as well. These settings are best for quick "point and shoot" photos. Our current recommendation is from the Canon line of digital cameras, such as the A700 (which is the 1st prize for the photo contest winner) or similar camera. Open the original file of the photo that you want to modify. Before you make any modifications, make a second version of the file by clicking on the "save as" option (this is usually in the "File" menu). A "save as" box will pop up on your screen. In the "file name" area, enter a different file name than that of your original photo. You can now edit or modify this new file in any way that you wish without fear of damaging the original photo file. For example, let's assume that you have a photo of a family birthday party that is perfect in all respects except that Uncle Bobby is quite prominently picking his nose. You would love to be able to crop Bobby out of the picture, but you don't want to degrade the quality of the original photo. If the original photo was named 06051101_bday.jpg (to indicate 5/11/2006 birthday), you could make a second version using "save as" and call it 06051101_bday_nobob.jpg) before you edit the image. Once you "save-as" the file, you can cut Bob out of the image and then "save" the image without damaging the original that you may someday want to use at Bob's 80th birthday roast. The quality of the .jpg image that you save on your computer is related to the compression level that you select when saving the image. Most photographic software packages provide a range of compression or quality levels that you can select from. In the example below, high, medium and low quality images were saved (using the "save as" command) from an original to illustrate the effect of saving images at different .jpg compression settings. Note the different sizes of the files associated with each image. Click on the thumbnail image to view the full size image. To see the effect of image size and compression level on the quality of the image, compare the leaf edges and the Bipolaris lesions on the bermudagrass leaves in the 3 version below. For email and web communication, keep images at less than 200 KB. For people who have dial-up access, keep image size less than 64 KB. Digital cameras operate well in automatic or program mode. However, when photographing turfgrasses, there are some tricks for obtaining good images that require use of manual controls. White balance: One of the first steps you should take in preparing to take a photograph is to check to be sure that the white balance matches the current lighting conditions (full sun, shade, overcast, flash, incandescent, fluorescent). In many cases, setting the camera to automatic white balance will result in capture of an acceptable image, but improved images will be obtained if you properly set the camera white balance. Click on the thumbnail image above to view an enlarged image of the impact of white balance on color. For example, in overcast conditions, the light that reaches the grass is more blue compared to full sun. The light that reaches the grass during early and later hours of the day is warmer - it contains more red. We generally do not have much control over how much light is coming into the lens, unless we are using supplemental lighting such as a flash. Therefore, the important factors are ISO, f-stop, and shutter speed. Each of these will be discussed below. ISO is a measure of the sensitivity of the sensor in the camera and it is frequently adjustable. For low light conditions, ISO 200 or lower should be used. For situations where you are trying to stop motion (for example, when it is windy and objects are swaying in the breeze), the sensor is set to high ISO values (400 or higher). More expensive cameras provide a wider range of ISO values to allow photography without the need for supplemental lighting (in low light conditions) or to stop fast moving objects. F-stop is simply a measure of the lens iris opening, or the aperture. The number represents the ratio of the focal length of the lens divided by the size of the iris opening. F-stops are frequently noted as a ratio such as f/16. The larger the f number (16 in this example) the smaller the opening, the less light will pass through to impact the sensor. The benefit of a small iris opening is that the depth of field is greater compared to a larger opening. Alternatively, small f-stop numbers indicate a wider aperture opening, more light coming through the lens, and a lessened depth of field. Click on the photo to the right to see how the aperture changes as the f-stop is changed. The table below illustrates the the differences caused by different f-stop settings and the resulting changes in depth of field as the iris opening changes. Note that as the iris opening decreases from f/4.5 to f/29, the shutter speeds (see below) were increased from 1/5000 sec to 1/160 sec to compensate for the reduced light that enters the lens. The iris opening is f/4.5. Note that the red flowers are in focus but the background white flowers are out of focus. The shutter speed was 1/5000 sec. The iris opening is f/8. Note that the red flowers are in focus and the background white flowers are slightly out of focus. The shutter speed was 1/2000 sec. The iris opening is f/29. Note that both the red flowers in the foreground and the white flowers in the background are both in focus. The shutter speed was 1/160 sec. Shutter speed regulates the amount of light that is collected by the sensor after the light passes through the lens. Conventional film cameras had a physical barrier between the lens and the film that acts as the shutter, but many digital cameras operate by turning the sensor on and off for the designated period of time without the need for a shutter. The longer the shutter is open (or sensor is turned on), the more likely that movement of the subject will be detected and the more likely it is that the image will be blurry. Click on the thumbnail above to view a composite image that illustrates the impact of shutter speed on image quality when the subject is moving. Slow shutter speed can be used artistically to improve a photograph to emphasize movement. In most cases, however, fast shutter speeds, such as 1/125 sec or faster (1/250 sec, 1/500 sec etc) will provide an improved photo. If the lighting is low and fast shutter speed can't be used (because fast fast shutter doesn't allow in enough light), check the camera ISO setting to see if it can be increased to be more sensitive to light and to allow a faster shutter speed. Also check to be sure that the aperture is open to allow the maximum amount of light as discussed above. For shutter speeds below 1/125 sec, consider using a tripod to steady the camera. For the artist, composition plays a major role in the visual impact of a the photograph. Though composition isn't as critical when communicating technical concepts, the best technical photos manage to combine both artistry and accuracy in the same picture. In other words, it is worthwhile to pay a little attention to composition - just don't let it override the considerations of focus, exposure and color described above. There are many web sites that can help you with composition but we will mention one simple guide, the rule of thirds. When taking a photograph, the main subject of the image should be placed at one of the intersecting points where the image is broken into thirds vertically and horizontally. The red dots illustrate where the main subject of the photograph should be placed to improve the composition of an image. With the main subject centered in the image, the photograph does not appear very interesting (though in real life, we hear that she is actually quite fascinating!). Even with the use to the rule of thirds, the image is still not THAT interesting but the photograph has been improved by cropping the image to result in placement of the main subject over one of the rule of thirds locations. This newsroom is provided as a resource for professional communicators who work with the turfgrass industry. The press releases, background information, graphics and photographs posted here are available for use in articles, broadcasts and other media formats, but we ask that you credit PACE Turf as the source of the information. Click on the logo for the Global Soil Survey for Sustainable Turf below in order to see the full scale image. PACE Turf provides its membership with a vast amount of turf management information on its website at www.paceturf.org. For the first time, PACE Turf extends permission for GCSAA chapter webmasters and newsletter editors to post or print the links to a number of its turf tools. In effect, GCSAA chapters will be able to make a PACE Turf Management Toolbox available to its members free of charge. Contact your webmaster to request that the following html code be added to your GCSAA chapter website in the appropriate location. 3/18/11: Help increase awareness of Earth Day 2011 by printing and posting the "Golf - The Green Sport" (4 MB pdf) mini-poster in your pro shop and locker rooms. Encourage recycling and conservation when asked about Earth Day. We share the planet, let's share the responsibility of keeping it clean and healthy. Earth Day 2011 falls on 4/22/2011. For those of you that are participating in the Bayer Accolades program, we are pleased to announce that you can now use your rewards points to purchase PACE Turf memberships. Just login to the Bayer Accolades website, and go to the "Rewards Catalogue" section. You can get to the PACE Turf membership either by typing "PACE Turf" into the search box, or by selecting "Memberships" in the catalog menu. It will take 38,036 points to cover the annual PACE Turf membership fee of $275.00. February 29, 2008: Brown ring patch (Waitea) study receives GCSAA funding, 2/29. The project, "Management and Biology of Brown Ring Patch on Annual Bluegrass Greens" led by researchers Frank Wong, Ph.D., University of California, and Larry Stowell, Ph.D., PACE Turf, has received two years of funding from national and regional chapters of the Golf Course Superintendents Association of America. A total of $62,000 will be provided to the project over a 2-year period. November 8, 2007: "Virtual irrigation audits" (1,228 KB), a PACE presentation made at the 2007 Crop Science Society of America Annual Meeting. July 16, 2007: "Testing the Aqua-PhyD Water Conditioner"
July 9, 2007: "Effect of leaching greens on soil chemistry"
February 5, 2007: Cactus and Pines GCSA presentation, "History of rapid blight in the southwestern U.S."
December 11, 2006: Agronomy Society of America presentation Soil Compaction Evaluation with the Spectrum Technologies SC-900 Before and After a Rolling Stones Concert at Petco Park". If you are concerned that high soil salinity may be damaging your turfgrass, we suggest that you consider a regular monitoring program with an electrical conductivity meter. The method for using the meter to keep track of salinity and to trigger leaching events is described in the Monitoring Soil Salinity PACE Reference (29 KB pdf). By joining ($325/year), you will receive full membership benefits as well as access to PACE Surveys, Forums, Super Journal and the Photo Gallery. By registering (Free), you will receive free access to PACE’s Pest Surveys, Forums, Super Journal and the Photo Gallery. By signing up for a free trial membership you will receive PACE’s weekly email updates (sent out every Monday) for three consecutive weeks. These publications are one of the core components of PACE membership and feature current news and research on pest and turf trends from around the country, as well as information on new and effective management strategies. Card Verification Value, or CVV2, is a security measure that we require for all credit card transactions. Since the CVV2 number is listed on your credit card, but not stored in other locations, the only way to know the correct CVV2 is to have the card in your possession. All Visa, MasterCard and American Express cards now have this security feature. For Visa or MasterCard, turn your card over and look in the signature strip. You will find either the entire credit card number or just the last 4 digits of the credit card number followed by a space and a 3-digit number. That 3-digit number is your CVV2 number. If you can not read the CVV2 number, you will have to contact your card issuer or mail in your payment. For American Express, the number is imprinted on the front of the card and to the right side above the last few digits of the account number. 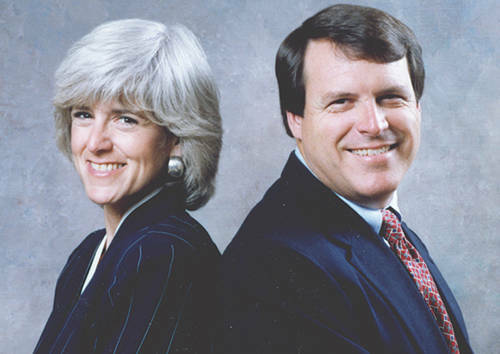 Wendy Gelernter, Ph.D. and Larry J. Stowell, Ph.D. are PACE Turf’s founders and owners. Their complimentary backgrounds in entomology, plant pathology, agronomy and crop science, combined with their interest in translating turfgrass research into practical management solutions are the basis of their work at PACE Turf. In addition to being business partners, Wendy and Larry have been married since 1986, and live and work in San Diego, California. Wendy Gelernter is an entomologist who received her B.S. from Cornell University 1976 and her Ph.D. from the University of California, Riverside in 1984. Before joining PACE in 1995, Wendy was the Director of Commercial Development for the agricultural biotechnology company Mycogen Corporation, where she worked for 11 years. Wendy is the author of numerous scientific publications and has served in leadership positions for several professional organizations including the Society for Invertebrate Pathology, the Entomological Society of America, and the Association of Applied IPM Ecologists. She is a past President of the Society for Invertebrate Pathology and serves on the editorial board of the scientific publication, Biocontrol Science and Technology. Larry J. Stowell founded PACE Consulting in 1986 and the PACE Turfgrass Research Institute in 1993. The research and consulting businesses were blended together and renmaed PACE Turf in 2008. He is a plant pathologist, certified professional agronomist, licensed pest control advisor and qualified applicator who received his training at the University of Arizona, where he obtained his B.S. and Ph.D., and at the University of California, Davis, where he conducted post-doctoral research until 1982. Before founding PACE, Larry was the Director of Mycoherbicide Development at the agricultural biotechnology company, Mycogen Corporation. He is the author of numerous scientific publications and two patents, and has served in leadership positions for several professional organizations including the American Phytopathological Society, American Society of Agronomy, National Alliance of Independent Crop Consultants and the Association of Applied IPM Ecologists. He serves on the Editorial Board of Applied Turfgrass Science. REGISTERING: If you are interested in participating more actively on the PACE website, you are urged to register here free of charge. However, for maximum access to all PACE Member Benefits, please consider joining the PACE Turfgrass Research Institute today. A summarized comparison of the benefits and access offered to members vs. registered participants is provided in the table below. 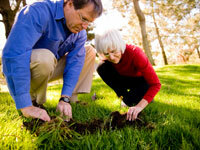 Super Participants are golf course superintendents or other professional turf managers. In addition to the access provided to registered Participants (see below), Super Participants may also post reports of pest incidences in the Pest Surveys Forum. Participants may participate in the Photo Gallery and Photo Gallery Forum and may provide follow-up commentaries on reports in Pest Surveys. However, only Super Participants and Super Members may post reports of pest incidences in the Pest Surveys Forum. This procedure helps prevent the reporting of duplicate pest reports from the same location. Join the PACE Turfgrass Research Institute off-line by printing out and mailing the Printable Membership Form with payment. Sign-up on-line and mail in payment off-line. This method will provide participant-level access until payment is received at which time full membership will be activated. Super Members are golf course superintendents or other professional turf managers who receive all membership privileges (see table below). In addition, Super Members may also post reports of pest incidences in the Pest Survey Forum. Members are entitled to full membership benefits, but are not golf course superintendents or professional turf managers. Members receive all membership privleges and may provide follow-up commentaries on reports in Pest Surveys. However, only Super Members or Super Participants may post reports of pest incidences in the Pest Surveys Forum. This procedure helps prevent the reporting of duplicate pest reports from the same location. On-line credit card transactions are executed on our secure server with Secure Site Pro excryption from VeriSign that steps old browsers up from 40 bit to 128 bit encryption to provide the best encryption and security available. We take great pride in the quality of the services and information that are offered to PACE Turf members and have never yet had to issue a refund. However, if you are not satisfied with the membership services, we will accept cancellation of your membership at any time by refunding a portion of your annual membership fee (as determined by the time elapsed since your subscription was initiated), as indicated below. Please contact PACE Turf to request a refund. You can contact us by phone at: 858.272.9897 or by email using the Contact us link. Refunds will be issued by check if the original payment was made by check. If the original payment was made by credit card, refunds will be issued by credit card. PACE Turf's refund policy, as currently published herein, represents PACE Turf's sole obligation with respect to PACE Turf membership refunds. This user agreement covers the terms and conditions for users of the PACE Turf PUBLIC website ("PUBLIC website") and the PACE Turf member website ("Member website"). If you choose to register on the PACE Turf PUBLIC website (“PUBLIC website”), you will be agreeing to abide by all of the terms and conditions of the agreement below. The PUBLIC website is provided by PACE Turf as a free PUBLIC service to the turf management community in order to promote education, communication and improved agronomic practices for turfgrass. Unless otherwise specified, you are encouraged to share, copy or distribute the contents of the PUBLIC website for any non-profit, educational purpose, without obtaining additional permission. All images must retain the photographer’s credits (if they are present) for all usages. For permission to use any of the contents of PUBLIC website for commercial or for-profit uses, Contact us. Super Journal: electronic journal for PUBLICation of applied turfgrass research conducted by superintendents, turf managers, researchers and consultants. PACE Turf may change, add or remove portions of this Agreement at any time, but if it does so, it will post such changes on the appropriate website. You acknowledge that the opinions and recommendations contained in this Website are not necessarily those of PACE Turf or endorsed by PACE Turf. PACE Turf may provide links on the Website to other websites which are not under the control of PACE Turf. These links are provided for convenience of reference only and are not intended as an endorsement by PACE Turf or the organization or individual operating the website or a warranty of any type regarding the website or the information on the website. You represent, warrant and covenant that no materials of any kind submitted through your account will violate, plagiarize, or infringe upon the rights of any third party, including copyright, trademark, privacy or other personal or proprietary rights; or contain libelous or otherwise unlawful material. You hereby indemnify, defend and hold harmless PACE Turf from and against any and all liability and costs, including, without limitation, reasonable attorneys' fees in connection with any claim arising out of any breach by you or any user of your account of this Agreement or the foregoing representations, warranties and covenants. You shall cooperate as fully as reasonably required in the defense of any such claim. Neither PACE Turf nor the PUBLIC Website represent or endorse the accuracy or reliability of any advice, opinion, statement, or other information displayed, uploaded, or distributed through this service by any user, information provider or any other person or entity. You acknowledge that any reliance upon any such opinion, advice, statement, memorandum, or information shall be at your sole risk. THE PUBLIC WEBSITE AND ALL DOWNLOADABLE SOFTWARE ARE DISTRIBUTED ON AN "AS IS" BASIS WITHOUT WARRANTIES OF ANY KIND, EITHER EXPRESS OR IMPLIED, INCLUDING, WITHOUT LIMITATION, WARRANTIES OF TITLE OR IMPLIED WARRANTIES OF MERCHANTABILITY OR FITNESS FOR A PARTICULAR PURPOSE. YOU HEREBY ACKNOWLEDGE THAT USE OF THE PUBLIC WEBSITE IS AT YOUR SOLE RISK. If you choose to use the PACE Turf Member Website (“Member Website”), you will be agreeing to abide by all of the terms and conditions of the agreement below. The contents of the Member website are intended for your personal, noncommercial use. All materials published on the Member website (including, but not limited to PACE Turf Insights, PACE Turf References, PACE Turf Clubhouse Editions, PACE Turf Updates, Weather , Weather History, Photo Gallery and Member Forums, collectively also known as “Content”) are protected by copyright, and are owned or controlled by PACE Turf, or the party credited as the provider of the Content. You may not modify, publish, transmit, participate in the transfer or sale of, reproduce (except as provided in the paragraph below), create new works from, distribute, perform, display, or in any way exploit, any of the Content or the Member website (including software) in whole or in part. You may download or copy the Content and other downloadable items displayed on the Member website for personal use only, provided that you maintain all copyright and other notices contained therein. Copying or storing of any Content for other than personal use is expressly prohibited without prior written permission from PACE Turf or the copyright holder identified in the copyright notice contained in the Content. PACE Turf may change, suspend or discontinue any aspect of its membership services at any time, including the availability of any feature, database, or content. PACE Turf may also impose limits on certain features and services or restrict your access to parts or all of the PUBLIC Website and/or the Member Website without notice or liability. Courteous and respectful language must be used at all times. You shall not upload to, or distribute or otherwise publish on the Forums any libelous, defamatory, obscene, pornographic, abusive, or otherwise illegal material. You agree that you will not threaten, personally attack or verbally abuse other participants, use defamatory language, or deliberately disrupt discussions with repetitive messages, meaningless messages or "spam." You agree not to use language that abuses or discriminates on the basis of race, religion, nationality, gender, sexual preference, age, region, disability, etc. Forums shall be used only in a noncommercial manner. You shall not, without the express approval of PACE Turf, distribute or otherwise publish any material containing any solicitation of funds, advertising or solicitation for goods or services. You are solely responsible for the content of your messages. However, while PACE Turf does not and cannot review every message posted by you on the Forums and is not responsible for the content of these messages, PACE Turf reserves the right to delete, move, or edit messages that it, in its sole discretion, deems abusive, defamatory, obscene, in violation of copyright or trademark laws, or otherwise unacceptable. You acknowledge that any submissions you make to the PUBLIC Website or the Member Website may be edited, removed, modified, published, transmitted, and displayed by PACE Turf and you waive any moral rights you may have in having the material altered or changed in a manner not agreeable to you. You acknowledge that the opinions and recommendations contained in this Website are not necessarily those of PACE Turf or endorsed by PACE Turf. PACE Turf may provide links on the Website to other websites which are not under the control of PACE Turf. These links are provided for convenience of reference only and are not intended as an endorsement by PACE Turf of the organization or individual operating the website or a warranty of any type regarding the website or the information on the website. Neither PACE Turf nor the PUBLIC Website or the Member Website represent or endorse the accuracy or reliability of any advice, opinion, statement, or other information displayed, uploaded, or distributed through these services by any user, information provider or any other person or entity. You acknowledge that any reliance upon any such opinion, advice, statement, memorandum, or information shall be at your sole risk. THE PUBLIC WEBSITE AND ALL DOWNLOADABLE SOFTWARE ARE DISTRIBUTED ON AN "AS IS" BASIS WITHOUT WARRANTIES OF ANY KIND, EITHER EXPRESS OR IMPLIED, INCLUDING, WITHOUT LIMITATION, WARRANTIES OF TITLE OR IMPLIED WARRANTIES OF MERCHANTABILITY OR FITNESS FOR A PARTICULAR PURPOSE. YOU HEREBY ACKNOWLEDGE THAT USE OF THE PUBLIC WEBSITE AND Member WEBSITE IS AT YOUR SOLE RISK. Paid membership in PACE Turf is required to obtain access to the Member Website. Free trial memberships of limited duration will periodically be made available for promotional purposes. however. For more information about membership in PACE Turf, see our documents on Member Benefits and on Joining PACE Turf. As part of initiating your membership, you will select a password and a user name. You may not use a Member ID that PACE Turf, in its sole discretion, deems offensive. You may terminate your membership at any time by contacting PACE Turf at the address below. The Refund Policy provides information on refund of membership fees. PACE Turf may, in its sole discretion, terminate or suspend your access to the Member Website for any reason, including, without limitation, breach or assignment of this Agreement. If access to the Member Website is terminated by PACE Turf, funds will be refunded in accordance with the Refund Policy. If you are in any doubt about the identity or cause of a turf problem, we highly recommend the use of a qualified turf diagnostician. Fortunately, there are several good labs around the U.S. who provide this service. Check with your local land grant university and/or county extension agent for information on regional diagnostic laboratories. If none are available, the following labs provide nationwide services for reasonable fees. Labs should be contacted prior to sample shipment for specific preparation and shipping instructions. Service offered: disease and nematode ID on turf samples from all countries, with the exception of the U.S. and Canada. 10:15 Managing for firm greens: can it be achieved within an IPM framework? Dr. Larry Stowell, PTRI. 12:45 Photography for IPM. Dr. Larry Stowell, PTRI. 1:30 Effects of water quality and quantity on IPM programs for bermudagrass. Dr. Shoumo Mitra, Cal Poly Pomona. For maximum access to all PACE Member Benefits, please consider joining the PACE Turfgrass Research Institute today. A summarized comparison of the benefits and access offered to members vs. registered participants is provided in the table below. The contents of the PACE Turfgrass Research Institute (PTRI) website are intended for your personal, noncommercial use. All materials published on the PTRI website (including, but not limited to PACE Insights, PACE References, PACE Clubhouse Editions, presentations, research reports and photos, also known as “Content”) are protected by copyright, and are owned or controlled by the PACE Turfgrass Research Institute, or the party credited as the provider of the Content. You shall abide by all additional copyright notices, information, or restrictions contained in any Content accessed through the PTRI website. The PACE Turfgrass Research Institute website and its Contents are protected by copyright pursuant to U.S. and international copyright laws. You may not modify, publish, transmit, participate in the transfer or sale of, reproduce (except as provided in the paragraph below), create new works from, distribute, perform, display, or in any way exploit, any of the Content or the PTRI website (including software) in whole or in part. You may download or copy the Content and other downloadable items displayed on the PTRI website for personal use only, provided that you maintain all copyright and other notices contained therein. Copying or storing of any Content for other than personal use is expressly prohibited without prior written permission from the PACE Turfgrass Research Institute or the copyright holder identified in the copyright notice contained in the Content. We invite you to join the world’s best informed turf managers by becoming a member of the PACE Turfgrass Research Institute today. For an annual fee of $325.00, members will receive a wealth of printed, emailed and on-line information. Take the PACE Tour for more information on membership benefits. PACE Turf was founded in 1988 by owners Larry Stowell, Ph.D. and Wendy Gelernter, Ph.D. to provide expert, objective, science-based advice and information to the turf management community. Using research results, on-the-ground experience, and their over 65 years of combined knowledge in agronomy, plant pathology, entomology, weed science and turf science, PACE Turf has long been a leader in translating science into practical turf management information, and in helping turf managers prevent problems before they occur . PACE Turf offers a membership information service that delivers science-based solutions to turf management problems with breaking research news, information and expert advice on products, practices, pests and weather threats. With information customized specifically for each member's location, PACE Turf delivers its clear, bottom-line conclusions via email alerts and a state of the art website that is uncluttered by advertising. To learn more about the benefits of PACE Turf membership, click here or sign up here. Free public services offered on the commercial-free PACE Turf website include access to turf management guidelines on pests, soils, water and plant analysis. In addition, PACE Turf’s Super Journal is an online turf research publication overseen by the PACE Turf Research Advisory Board. Super Journal contains an ever-growing number of turf research reports written by golf course superintendents and turf researchers, on topics ranging from turf IPM or integrated pest management, to soil, water and irrigation management, to new advances in turf monitoring practices and procedures. We have developed a quick, easy, on-site test that can detect excessive levels of soil nitrates. Although this test does not replace analytical testing, it provides values that are rough estimates of nitrate levels, and should be a useful and rapid diagnostic tool. Hach water test strips for nitrate/nitrite (Cat. # 27454-25, Hach Company, PO Box 389, Loveland, CO 80539. Phone: 800-227-4224. A bottle of 25 strips is $16.29 as of July, 2010. Dip the test strip into the soil suspension. For example, assume that the color on your dipstick indicates roughly 15 ppm nitrate, as it does in this photo. Remember -- the dipstick value needs to be converted to one that is accurate for soil nitrate! The soil nitrate concentration is therefore = (15 X 1.5) + 2.9 = 24.9. If the final value is over 20 ppm as it is in the example above, nitrogen applications of all types should be halted until levels are well below 20 ppm. If possible, leach the area to help bring nitrogen levels down more rapidly. It does not test for ammonium levels -- only for nitrate levels. Therefore, even if you have high ammonium levels in your soils, you will get a low reading from the dipstick. The test is designed to detect an excess of nitrogen, but it will not detect nitrogen deficits. To determine whether your soils are lacking in nitrogen, the soils should be sent to an analytical laboratory. The values you get with this test are rough estimates, at best. For more accurate readings, soils should be sent to an analytical lab for testing. The bulk density of a soil is a combination measure of the particle density and how tightly packed the particles are in the sample. Under ideal conditions, the bulk density of a soil is a measure of soil pore space and can therefore provide important information on the degree of compaction on golf course greens. In this article, the theoretical basis behind the bulk density measurement will be reviewed and its possible applications will be discussed through presentation of data recently generated at California golf courses. Get TurfNet's take on PACE Turf in the article, "Making Sense of Science". Check out our newest YouTube Videos on the PACE Turf YouTube Video Channel, and visit us on the PACE Turf Facebook page! For print publications on soil, water and pest management guidelines, check out our Turf Resources page.